Score ham with a sharp knife in a diagonal pattern. Repeat scoring, diagonally, in the opposite direction to create a crossing pattern. Insert whole cloves at the crossings. "I loved the glaze on this ham. Wish I would have make extra for serving. I left the cloves off because we are not big fans of the flavor they give to ham." 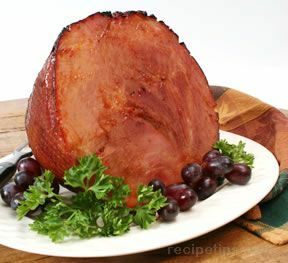 "I made this ham recipe for Thanksgiving and we loved it. 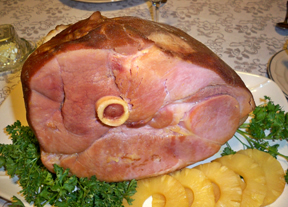 If you are looking for a Christmas ham recipe you should give this one a try. You won't be disappointed." 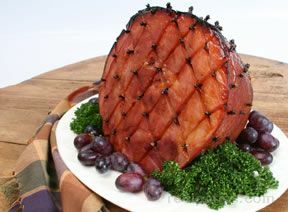 "This ham tastes even better than it looks! It was the perfect centerpiece for our Thanksgiving. 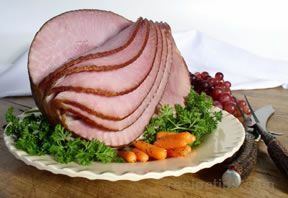 We had alot of leftover turkey because everyone preferred the flavor of this ham. Definitely will be made again and again." "This Ham look delicious! I am going to try it!!!"